I see conflicting guidance about whether or not to rinse the turkey before roasting it. So, should I or shouldn’t I? Despite what you might read in your favorite cookbook or go-to online recipe site, food safety authorities are steadfast in their warning not to rinse off raw turkey. This has been the recommendation for years, in fact. Unfortunately, if you search the Internet, you may find many faulty recommendations that involve rinsing and pat drying the turkey before setting it in the roasting pan. This just doesn’t make sense, and causes more problems than it solves. The reason is twofold: First, rinsing doesn’t work. 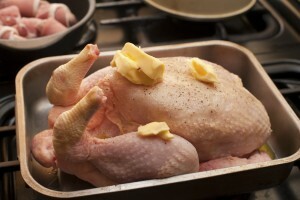 It’s true that raw poultry sold in the U.S. is often contaminated with Campylobacter, Salmonella or some other bacteria. It’s also true that poultry is the fourth most common food associated with foodborne illness, and the most common culprit behind deaths from foodborne illness in the U.S. But research by the British Food Standards Agency between 2000 and 2003 showed that rinsing off whole poultry, or beef for that matter, does not actually remove all of the bacteria from the surface of the meat. Second, and even more important, the act of rinsing off the turkey can actually splatter some bacteria from the surface of the meat all over your sink, onto your kitchen counter and over to anything that happens to be around it — the just-washed breakfast dishes in the drainer, for example, or the cutting board where you’re about to prepare a relish tray. Some estimates say the splatter can spread up to 3 feet away. The researchers examined what happens when people rinse off raw meat, and they concluded that the only effect is that it actually increases the likelihood of contaminating your hands and nearby surfaces. And it’s likely to strike places where you’ll be preparing foods that will not be cooked or roasted in an oven for a few hours where all that bacteria will be destroyed. What’s more, most people don’t clean up properly. According to the research, people tend to wipe down a counter or sink with a damp cloth and figure they’ve taken care of any microbiological hazard. Sure, you may be more careful than that. After the turkey is in the oven you might wash everything down with hot, soapy water, rinse it off, let it dry and then follow up with a santizing cloth or bleach solution. But it’s Thanksgiving Day — do you really have time for that? Wouldn’t you agree that it’s much easier not to rinse off the turkey in the first place? So, if your step-by-step guide to preparing Thanksgiving dinner includes the recommendation to rinse off the turkey, please skip that step, and you can feel quite smug about the decision. But be sure to wash your hands, and do so properly — with soap, for at least 20 seconds, rinsing under warm running water, and drying with a clean cloth or paper towel. Washing your hands properly and often is the best thing you can do to prevent foodborne illness. For more food safety guidance for the holidays and all year round, see foodsafety.gov. Editor: This column was reviewed by Sanja Ilic, Ohio State University Extension state specialist in Food Safety. Posted in Food Safety, Uncategorized	Tagged Food Safety, thanksgiving, Turkey	Bookmark the permalink. So the best thing is to leave the deadly poison on the turkey because you might splash it on the counter? Its not the bacteria, but the toxin they produce, that can kill you. this author makes me wonder if they have ever cooked a turkey. Vegans should not be allowed to write this type of article. LAMO!!!! !